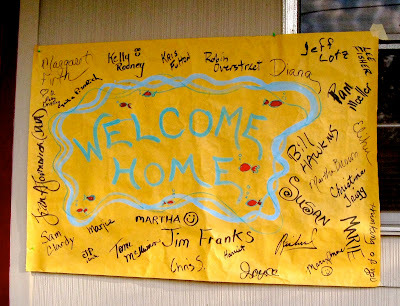 Retirement Daze: Home again, home again! 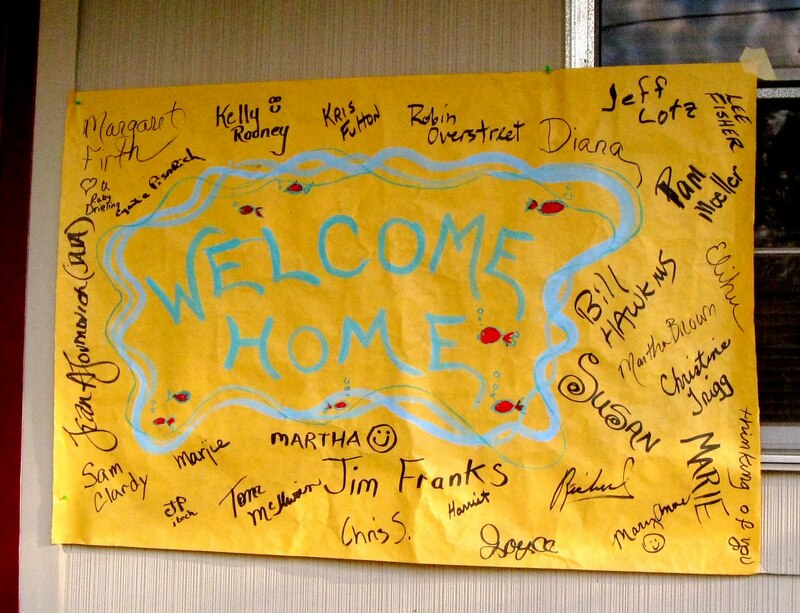 This welcome-home message from Gulf Coast Research Lab colleagues greeted me as we arrived home from the rehab center Tuesday, May 24. Hooray! I am home! I have actually slept three nights in my own bed, snuggling wth hubby. Departure from the Singing River Comprehensive Rehab Center in Pascagoula was scheduled for late afternoon Tuesday after husband Walter finished his school bus routes. That meant I had a full day of therapy. First night home included a fast-food supper, whohoo! . . . then early to bed for me. Exhaustion hits early and often these days. Wednesday, my first full day home, I slept practically the whole day except for welcomed visitors, therapy, a trip to Wal-Mart for items that facilitate independence, plus early morning wake-up routines and a few post-stroke housekeeping firsts accomplished with the help of my sister-in-law Lila. I came home with a wheel chair, but I am working on graduating to a cane. Left arm and hand are a bit slow waking up, so right now my knees and teeth are subbing as my left hand in a variety of tasks. I will be in outpatient therapy several days a week for about a month. I still intend to post about my early experiences as a stroke survivor. Previous attempts to reestablish a post-stroke working relationship with my computer were agonizing and totally frustrating and exhausting. I decided my brain and body weren't ready. Writing this post has been relatively easy in comparison, even though I am using my right hand only. That is encouraging; a sign to me that my brain is healing! Praise God and thanks again to all who surrounded me with prayer and are still praying for me. The journey continues! Linda, I was just thinking about you and wondering how you were doing. Now I know. What great news! What great news--that you are home! I think of you often, and have wondered how you are. Take care, hang in there, and know that we are cheering you on as you continue to recover! so good to hear from you, and Wow on the trip to Walmart, that would be my happy thing, i am a lover of WM. my prayer for you is that the wheel chair will soon be a thing of the past and the cane also. Linda, I am so happy to see you back at the computer. I know it is a challenge. When I had a stroke 6 years ago the last thing to work was the pinkie finger on my left hand. I still have some problems, but then I was never a very good typist. David got out of rehab on Manday and has been sleeeping a lot since. I don't think he got much rest in the rehab. HOORAY!!!!!!!!!!!!!! You have been in my thoughts and prayers so much, Linda!! My family has a stroke history, so I know how scary it is. Had you had high blood pressure? I know you will be back to normal in no time!!! Just know that I am praying and encouraging you on!! I got out of the hospital the very same day you did!! Though I have not been able to leave the house yet. Seems that you are doing better than me, how wonderful!! I was so glad to see this post. Thanks for letting us be a part of your journey. Your recovery is truly an answer to prayer. Continue to keep pressing on. Supporting you all the way. Thanks for positive energy, prayers and support. TO schmidleysscribblins, thanks also for update on David. And you are correct, rehab is work. I am sleeping a lot, too. And thanks for your encouraging words about your own stroke journey. To Ginny - had no idea you were going thru so much. Coming in late but am praying now.